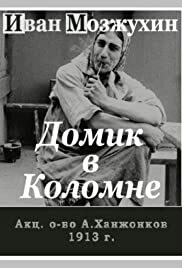 This is simply a delightful adaptation of Pushkin's verse story, "The House in Kolomna", with solid craftsmanship by Pyotr Chardynin and some fine performances from the cast. The cast and their director seem to get themselves thoroughly into the spirit of the story, and it is both interesting and entertaining to watch. The story is one of Pushkin's lightest works, a fluffy and fun household tale, yet with his usual keen eye for human psychology and behavior. It starts with pretty young Parasha and her officer boyfriend trying to trick Parasha's mother into accepting the boyfriend as the new cook, and then leads into some very amusing situations from there. The humor is a nice combination of the absurd and the subtle, and this adaptation does an impressive job of communicating almost all of it. Ivan Mozzhukhin seems to be having a great time in his role as the officer, and his performance is very entertaining and often rather resourceful. Sofya Goslavskaya is charming and engaging as Parasha, and she also gives a thoughtful performance that contrasts nicely with Mozzhukhin's boisterous style, making them a good working combination. Praskovya Maksimova, as the mother, has to play the straight part for most of the movie, but she also makes the most of her chances. It's really hard to see how a much better adaptation of this could be made even now, even with all of the advances in cinema techniques and resources since 1913. For its time, it is a wonderful job, an enjoyable comedy that has held up very well, and a movie that is well worth taking the time to see.